I love your color selection. I love the easy clean up of my tools after painting. I like that the paint smell isn't too strong. I love that my walls are easy to wipe clean when little hands make them dirty. But...why do your green paints require three to four coats even when using a paint with primer built in? It's not like I was painting over a dark or bright color. The wall was white-ish. 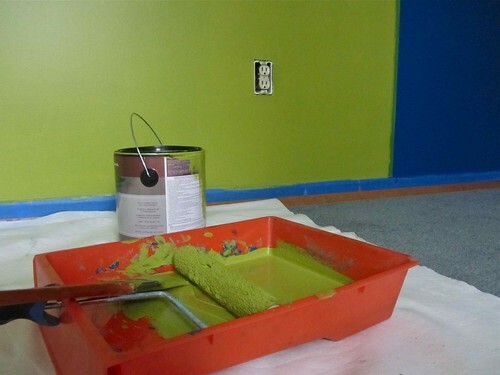 If I decide to paint green again I may have to get my paint from another company. This is a sneak of Meg's room. I'm am not very happy that I spent more money buying the paint with built in primer only to have to do 3 coats. What's up with that? By the way I LOVED the Frog tape. As long as you seal it (make sure it's stuck to the wall securely) before painting you get a crisp, clean line. I will for sure be using it on Mattey's striped walls.